Mumok Vienna: Museum for modern art, admission prices and opening hours mumok Museum 2019. The Mumok is a well-known and large museum of modern art in Vienna. It is housed in a modern building dating from 2001 in the Museumsquartier (museum area) near the city centre. 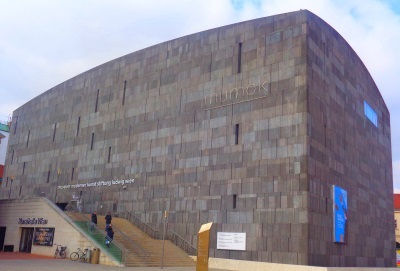 The Mumok Museum bears the full name „Museum of Modern Art Ludwig Foundation Vienna“. Peter Ludwig (1925 to 1996) was a German millionaire and, together with his wife Irene Ludwig, a passionate art collector. Several hundred of the approximately 9,000 paintings in today’s mumok art museum come from the private collection of the Ludwig couple. Among them are some very well-known works by Andy Warhol, Pablo Picasso, or Gerhard Richter. The mumok is a large museum, the exhibition has an area of almost 5000 square meters. The vast majority of the 9,000 paintings and other works of art is modern art, i.e. from the 20th and 21st centuries. In the famous art museum in Vienna you can see works by Picaso, Christo (the famous wrapping artist), Warhol, Roy Liechtenstein, Arman (famous object artist), Joseph Beuys and many more. Another focus of the mumok art museum is the so-called Viennese Actionism (Wiener Aktionismus), a world-famous art movement from the 1960s. Important figures in Viennese Actionism included Otto Muehl, Günter Brus and Hermann Nitsch. As far as we know, the Mumok in Vienna is by far the largest exhibition of works from Viennese Actionism. We were particularly impressed by the diversity and size of the museum. We think that every visitor to Vienna who is interested in art should definitely visit the Mumok Museum in Vienna’s Museumsquartier. Adults pay 12 Euro entrance fee. There are some discounts for groups, young people (students) and older people (pensioners). With discount reduced the entrance fee is about 8 to 9.50 euros. Important: Children up to the age of 18 do not pay admission to the Mumok. Admission with the Vienna Pass is free of charge. The Mumok Museum is open daily. On Monday the opening hours are short from 2 pm to 7 pm, on Thursday from 10 am to 9 pm. On all other days you can visit the art museum from 10 am to 7 pm. Many other large museums in Vienna are less than 200 metres away. These include the Leopold Museum (also art), the Kunsthistorisches Museum Vienna and the great Natural History Museum Vienna (more on this page). Very famous for modern art is the Guggenheim Collection Venice, in the old town. Also in Italy is the great Uffizi Gallery and Accademia Gallery, both in Florence. Also you should not miss the Vatican Gallery in the Vatican Museum.